Thomas D’Aquila | Staff Writer for "The Mount"
The freshman dorm is filled with intense feelings. Anticipation and rivalry charge the air as students gather together. The reason? 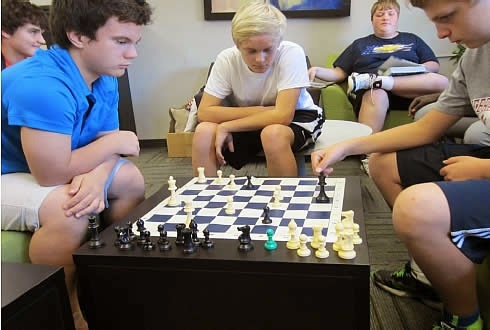 A chess tournament involving the freshmen class. The room grows quiet to only a dull murmur as the students make their move. It moves slowly, as the freshmen make decisions “Chess is a game that is not for the impatience,” said Jimmy Severa, a freshman. competes against Emmett Kenney (right) in a chess match. The tournament works as a two bracket system. Stu­dents play after school, before study hall or after study hall. Trying to fit day students into the picture provides a challenge. But that’s not the only reason not all of the first match­es are made. “Many people are stalling on their matches,” Struckman said. The tournament started in an organic way. The boys wanted to see “which out of them is the best” as Struckman put it. This is the second year for the chess com­petition, and it is also Struckman’s second year as freshman dean. For students that are helping others, there is a certain sense of accomplish­ment. “I feel like I am helping someone,” Freshman Matthew Thiel said. “[During the matches]I can start conver­sations with people and we can be inter­ested in chess,” said Severa of the casual nature of the tournament. “You can’t talk at [state] competitions, you’ll get kicked out.” Severa has gone to chess competi­tions with in a club at his grade school, of which he has been a part of since the third grade. Although he has not been going with the same frequency due to school, the opportunity of playing now is a treat. “We have fun competing against each other,” said Severa. Adjusting to high school is a difficult enough task for any freshman. Living at school presents itself with its own set of challenges. Luckily, students have their own way of bonding together which can soften the blow of homesickness.